We can help find the right hearing aid for you with our complete selection of hearing aid styles. We offer pediatric products and services to meet the hearing healthcare needs of children. Our team of Audiologists are committed to providing you with the best care possible. Take our online survey and discover if you can benefit from our hearing services. Hear the difference with our selection of the latest in hearing aid technology. 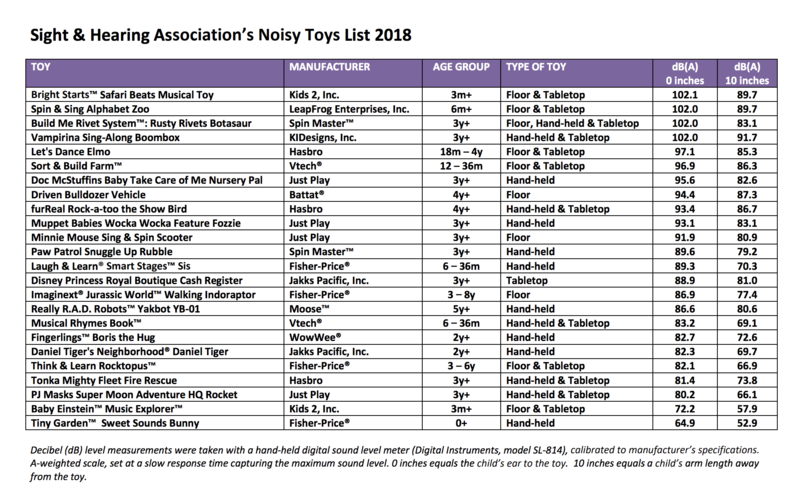 Sixteen toys out of 24 tested by Sight & Hearing Association (SHA) for their 21st Annual Noisy Toys List tested louder than 85 dB, which is the level set by the National Institute of Occupational Health and Safety (NIOSH) for mandatory hearing protection. What is most alarming is that the top two toys this year are intended for infants under the age of six months. A baby's ear canal is very small and it makes them particularly susceptible to loud noises, even brief exposure to sounds over 85 dB can cause permanent hearing loss over time. By exposing our littlest ones to loud toys at such an early age we are recklessly introducing them to a world that is filled with noise. The top two infant toys, Bright Starts™ Safari Beats Musical Toy and Spin & Sing Alphabet Zoo by LeapFrog tested at 102.1 dB and 102 dB, which can damage hearing in less than 15 minutes when placed at a child's ear. Both toys are engaging and educational, but do toys really need to produce deafening sounds to teach us rhythm or our ABC's? Toys are required to meet the acoustic standard set by the American Society of Testing and Materials (ASTM), which states that the sound-pressure level produced by toys shall not exceed 85 dB at 50 cm from the surface of the toy. While ASTM has acknowledged that 25 cm would be considered an average use distance for toys, they found 50 cm was a superior distance for measurement. And while there is no known sound limits that apply specifically for children, ASTM bases compliance on OSHA and U.S. military noise level limits for adults. According to SHA, “ASTM's testing standard is unreasonable. SHA believes that toys should be tested based on how a child would play with it, not how an adult would play with it. If you watch a child playing with a sound-producing toy you will see them hold it close to their face, next to their ears, which is much closer than a child's arm's length of approximately 10 inches (25 cm), let alone 50 cm for an adult.”, explains Kathy Webb, Executive Director of SHA.